Enoikiazetai 17 was a 2 month temporary performance space initiated by Luka Toyboy in an empty shop without electricity in a central Athens Stoa in the spring of 2016. I organized three performances in the space where I invited musicians and placed recordings throughout the building, following improvised scores. These projects were: Transposition Stories, Echo Hatch, and Dimensions 9 x 6 x 17. This improvisation will activate the entire building of the stoa, with a focus of concentrated energy on the project space shop. 9 improvisers, stationed through out the building at 9 positions. Everyone will begin pulsing on one note from the harmonic series, pictured above. Luka will send a tempo via a drum machine to the walkie-talkies. Go ½ time, ¼ time, 1/8 time with this rhythm. The musician at the top of the stairs will slowly descend. Over the course of the improvisation, each musician will move 9 times, towards the shop. This movement is led by the musician descending the 9 stories of the building. After the descending musician reaches each floor, they will send a walkie-talkie message, which will reach the musician in the elevator, the musician on the balcony, and one musician in the basement (who will all also have walkie-talkies on the same frequency). This lets the others know to move to the next position and to change their note to the next in the harmonic series that they choose. Those without walkie-talkies just need to listen the shift in tones in the building. Each musician chooses for themselves what their next “station” will be, just knowing the final 9th movement will bring them into the shop. At the 3rd, 6th, and 9th (in the shop), movement musicians will either halve or double their tempo. When everyone reaches the shop, a bike light will go off, and Alyssa will tap the window (which makes a big sound!) 3 times. We will all play 17 trilling pulses (at whatever tempo you choose, syncopation welcome and whatever note in the series you choose, harmonic timbre welcome). Each musician stops after their 17th pulse. There is additional documentation from local arts organization at the Gary Area website. 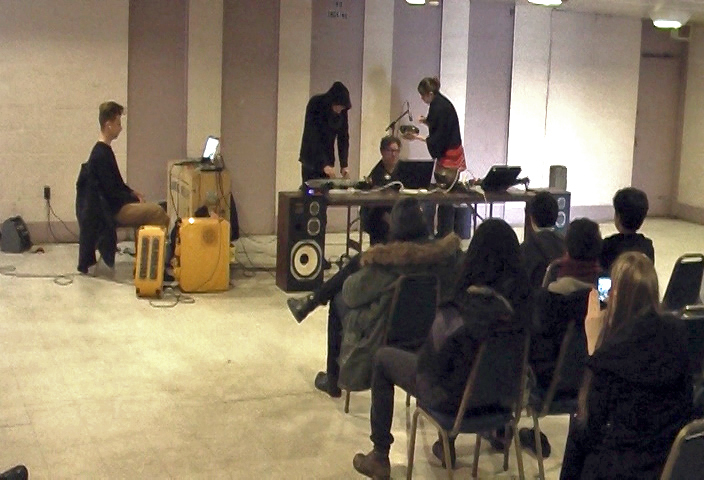 Radius FM, an experimental radio broadcast platform based out of Chicago joined our group for a performance on 24th January, 2015 with local experimental musician and EVP specialist Michael Esposito. 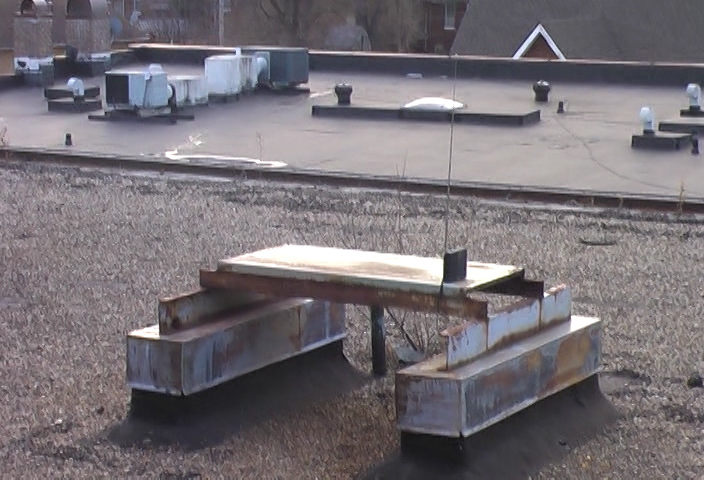 The transmitter was set up on the roof of a local parks pavilion, within walking distance to a former Bell Telephone Warehouse. We then listened to a performance of Esposito's work, integrating field recordings from the switchboard warehouse and live improvisation with flexi-discs and singing bowls. We also listened to the Waveguide Radio participants compositions and then embarked on the journey to the warehouse where we listened to a repeat of the broadcast through handheld and car radios. 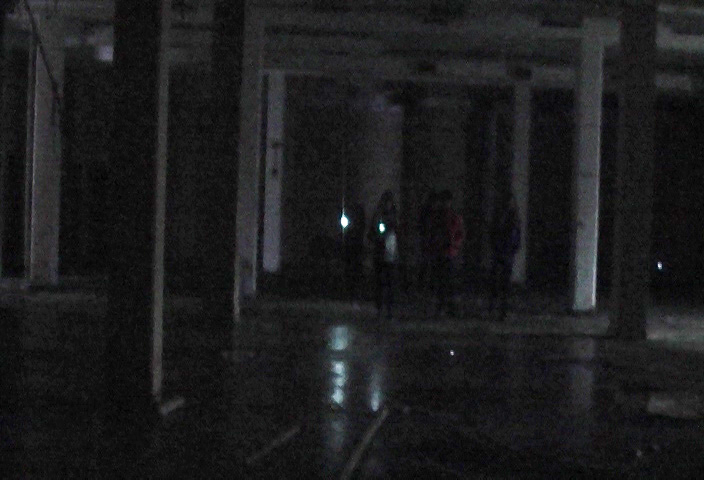 "Spectral Switchboard" consists of Electronic Voice Phenomenon (EVP) recordings captured from various flexi records and at an Indiana Bell Switchboard Warehouse in Gary, Indiana. The work asks: Do the memories and remnants of millions of phone calls passing through a single space such as a switchboard remain? Maybe even develop an independent existence within a single space? Is it possible that almost the entire range of human emotions could be bound to a single, saturated environment? With the use of field recordings and certain historical and ambient recordings on sound sheet technology, Phantom Plastics attempts to document and perform the possibilities that not only do our oral communications over telephone wires contain the energy of our human emotions, but also that they create their own ghosts that still exist in the ether. Episode 59 was performed by Michael Esposito (electronics, singing bowls), Alyssa Moxley (turntable, singing bowls), and Anthony A. Dunn (electronics).